(Clearwisdom.net) A Christmas Parade was part of the holiday celebration in Jefferson City, the capital of Missouri on December 6, 2003. The theme of this year's parade was "Discover Holiday." 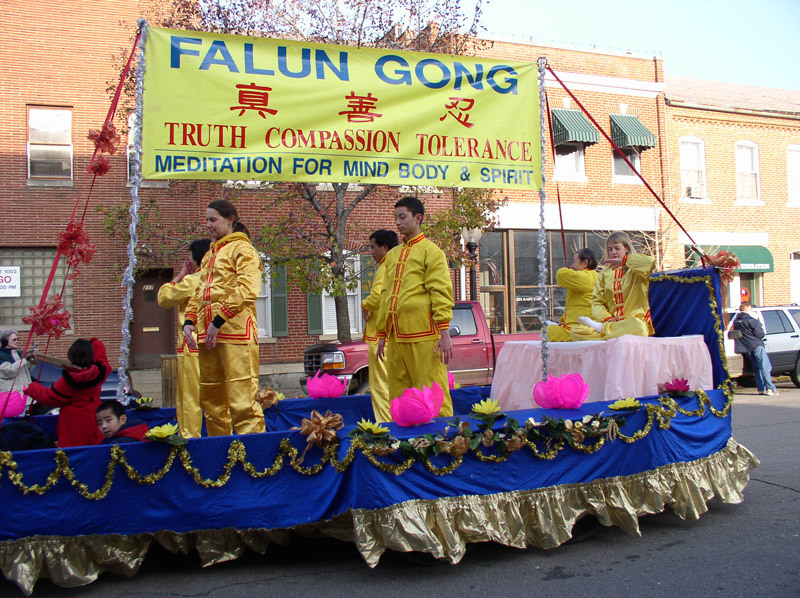 What discoveries did Falun Gong practitioners bring to the holiday? In this state capital city, many residents are government officials and staff, and Falun Dafa was not new to them. The Capitol Building has witnessed Falun Dafa practitioners' truth-clarification efforts again and again, including a commemorative activity on the fourth anniversary of the April 25th Appeal and Falun Dafa Day on May 13. After learning the truth about Dafa, the state government and congress gave Dafa great support and honors, including four awards. The Governor announced May as Falun Dafa Month. 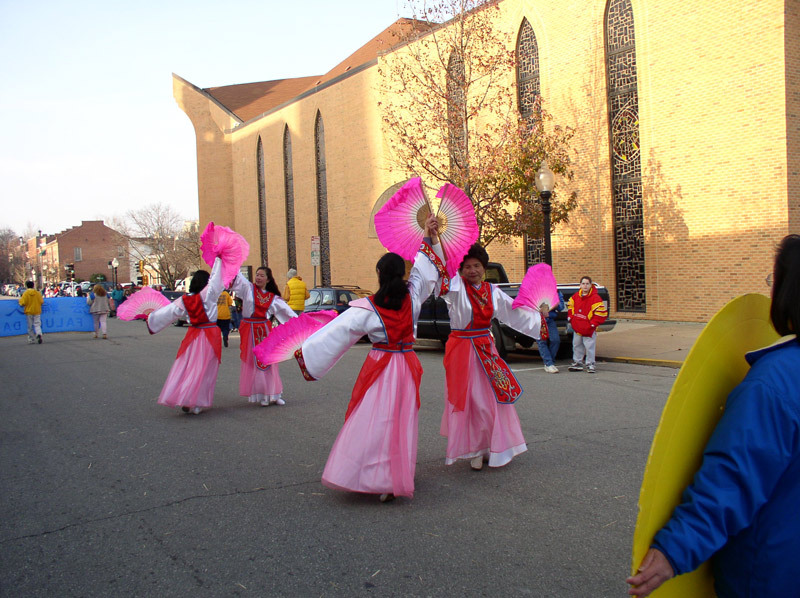 To thank local residents for their support and to show more people the beauty of Dafa, Falun Gong practitioners participated in this year's Christmas parade. It was a cloudy winter day, but the sky became clear when practitioners finished decorating their float. The float itself deserves to be mentioned. 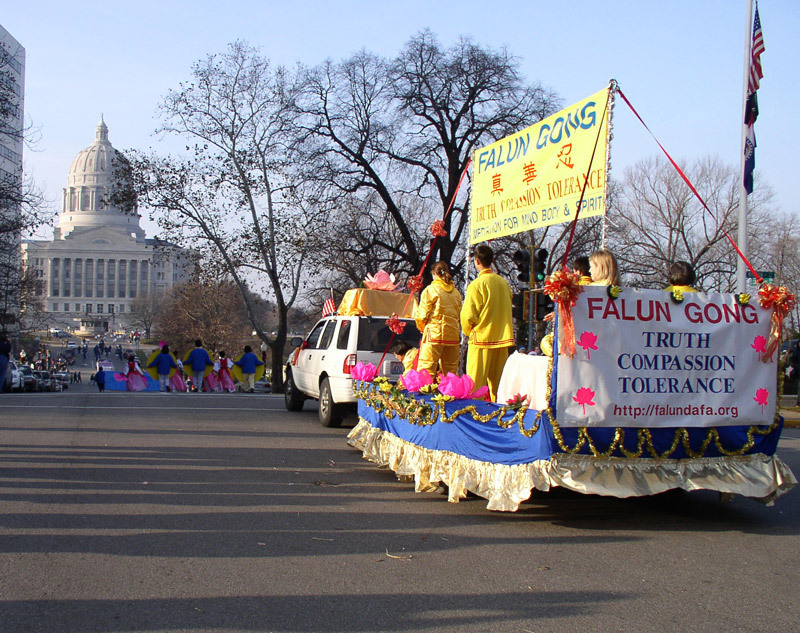 Unlike other Christmas floats with expensive and fashionable decorations, the Falun Gong float was an ordinary trailer. All the decorations were designed and hand-made by practitioners. It has been with us in many parades and has won many trophies. A practitioner said, "These decorations were made little by little in our spare time. It was hard work, but we put a lot of thought into them. We hope to bring the beauty of Dafa to the American public to show thanks for their great support. The float stood out and was welcomed. Every little detail was filled with our sincere good will." An attractive float, peaceful exercise demonstration by Chinese and Western practitioners, charming music and splendid fan dancing created a beautiful picture. Peopled filled the street, clapping for and praising the parade. Some people pressed their hands together in front of their chest to show respect, while others gave us a bow. Some shouted "Thank you!" in Chinese. Truth-clarification materials were distributed to people on the street and in restaurants. Some people even came out of stores to get them. One person could distribute hundreds of copies in a short time. Children standing with Christmas gift bags in hands were happy when we put truth-clarification materials in their bags. It was the best Christmas present. 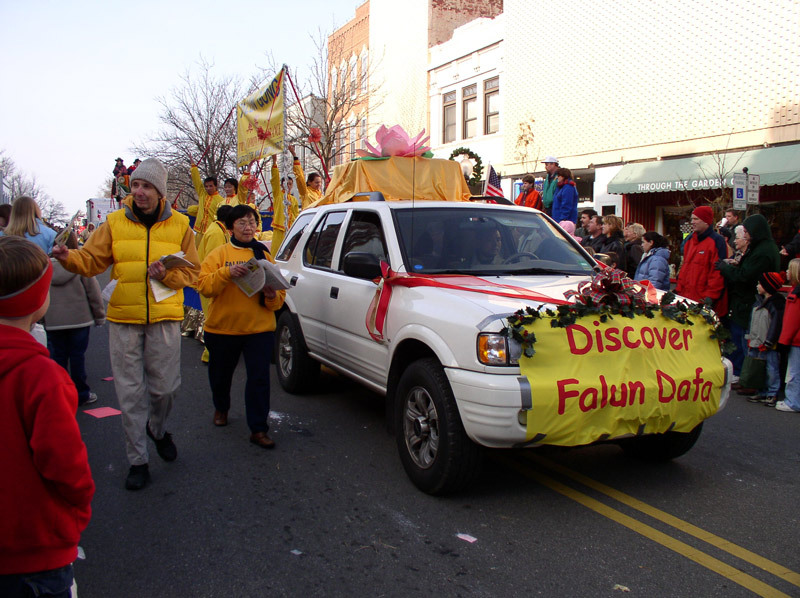 As stated on our golden banner on the float, more people in Jefferson City would "Discover Falun Dafa." It was a really good discovery on this holiday.